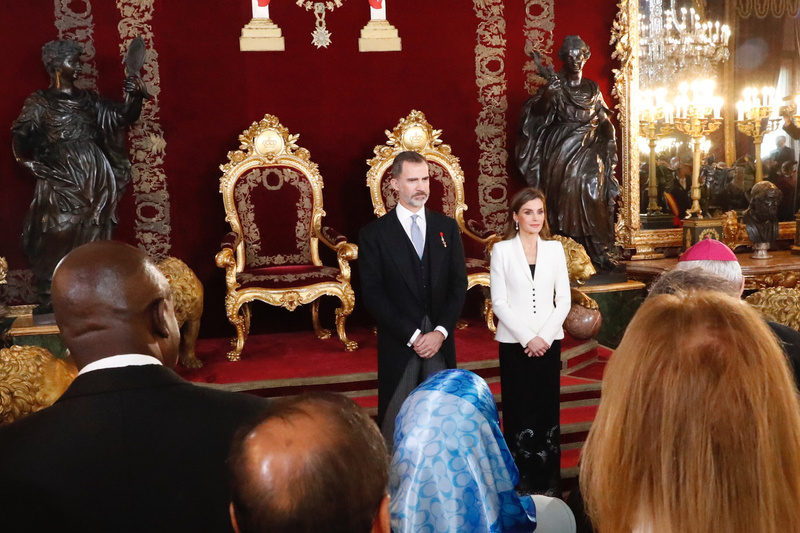 Today King Felipe VI and Queen Letizia of Spain offered the traditional annual reception to the Diplomatic Corps accredited in Spain at the Royal Palace of Madrid. The reception was also attended by the Prime Minister, Mariano Rajoy, and Minister of Foreign Affairs and Cooperation, Alfonso Dastis. 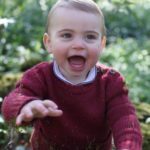 After the greetings, the reception took place in the Throne Room of the Palace. 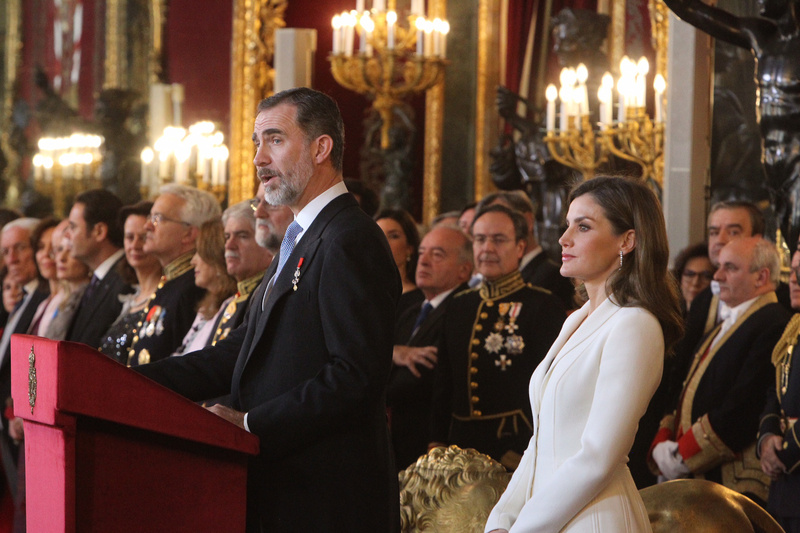 Speaking at the event, King Felipe stressed that “Spain is an open, plural and committed country that contributes, and wishes to do so more, to collective security, to the response to major crises, such as refugees and migrants, to forging, in short, of a more equitable and more sustainable world”. After the speeches of His Majesty the King and the nuncio of His Holiness the Pope, the act concluded with the usual reception in the Hall of Columns of the Royal Palace. 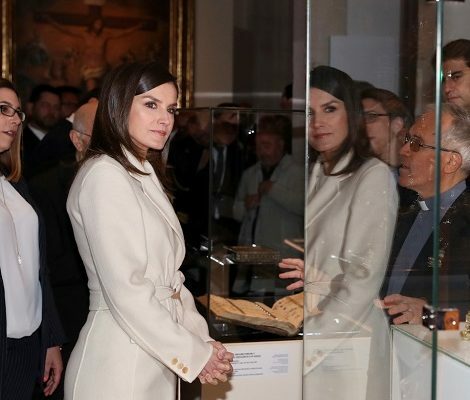 Once again in the New Year, Queen Letizia decided to recycle her wardrobe for the annual event. 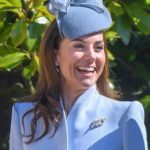 Queen chose the outfit she wore during Military Easter of 2016. The Felipe Varela outfit contains a bespoke white peplum jacket and a perforated black silk skirt. Underneath the jacket Queen wore a black top. 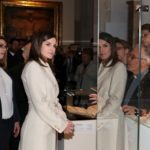 Letizia accessorized the outfit with pair of diamond and pearl earrings that belongs to the jewelry of the Royal House. They are made of pearl that hangs from seven diamonds. Letizia finished her look with Lodi black patent leather with concealed platform that were debuted in December 2017 during the delivery of the Prize for the Magistral Action 2017. 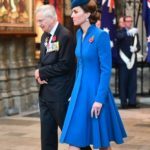 Here is a look at the outfits wore by Queen at the annual reception in last few years.